This was the first workshop in a series of seven workshops to be held in the northeast province in the next two months sponsored by NECORD with the assistance of GTZ. 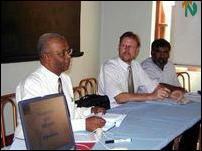 The second three-day workshop is to be held in Jaffna on February 6, sources said. "NECORD has taken four steps to strengthen the construction industry in the northeast province. As a first step the NECORD has invested forty million rupees to train four hundred youths which has been undertaken by the World University Services of Canada (WUSC). The second one is with the assistance of the Institute for Construction Training and Development (ICTAD) NECORD has taken action to upgrade the contractors now in the field in the NorthEast and also to register new contractors," said Mr.Lankaneson. Elaborating on the other two steps Mr.Lankaneson said, "at the insistence of NECORD the Treasury has granted fifty million rupees to the Construction Guarantee Fund for the NorthEast contractors on reduced interest rates. The fourth step is to organize workshops for contractors to enhance their capability and capacity. 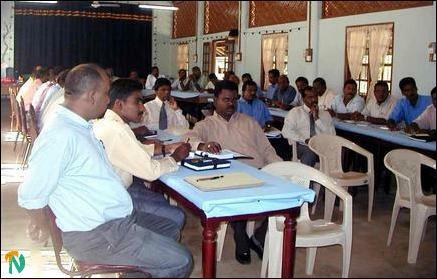 The first of such workshops is now being held in Trincomalee". The two-decade-old war in the northeast province has killed and maimed more than sixty five thousand people and large number of persons have not been accounted for. More than a million people have been displaced and more than 1.5 million people have lost their livelihood. Social fabric has been afflicted with deep fractures, said Mr.Lankaneson. Discrimination, denial of equal opportunities and over centralization of administration have led communal tension and social stress in the northeast province, he added. "Physical bleeding has stopped but number of measures has to be taken to eliminate cultural, racial and social differences to build a Sri Lankan identity. It is essential that we must have a system to ensure equality to all citizens to rehabilitate and reconstruct the war ravaged NorthEast province," said Mr.Lankaneson. German Technical Co-operation (GTZ) consultant Mr. Walter Keller in his welcome address said the workshop has been organized to solve existing problems government departments. NECORD and Asian Development Bank have had issues with contractors and these workshops provide contractors a forum to voice their problems. The main aim of the workshop is to enhance the capacity of contractors working in the construction industry in the northeast province, Mr. Walter Keller said.